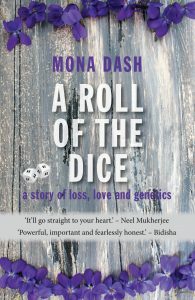 We’re delighted that 2018 shortlisted writer, Mona Dash, has her book A Roll of the Dice on pre-order now. The memoir, published by Linen Press, tells the story of Mona’s first child, who was born with SCID (Severe Combined Immuno-Deficiency), for which there is no treatment in his country. And so begins her roller-coaster journey which spans ten years, takes her from India to London, and involves her in the complexities of genetic medicine. Mona Dash writes her story of genetics roulette without self-pity, with astounding courage and even humour.